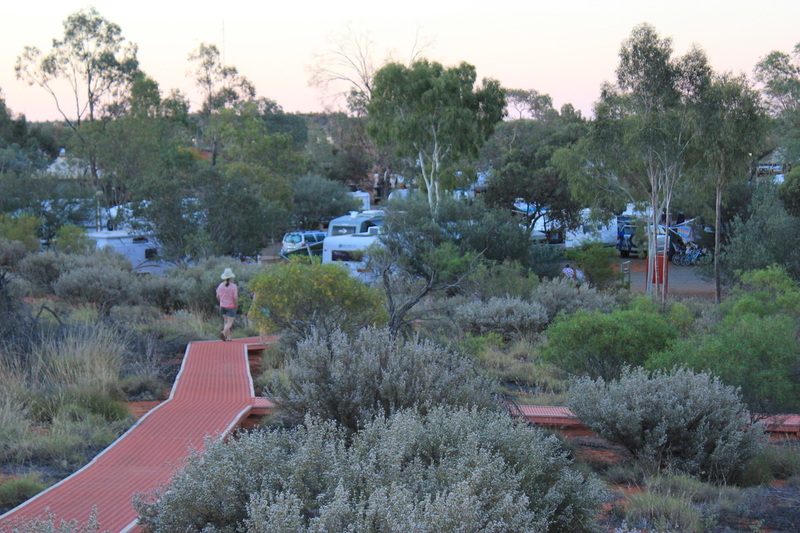 Yulara Campground, is the only camping area close to Uluru (Ayers Rock) and is part of the Ayers Rock Resort. The resort comprises 5 hotels, plus the campground, so there really is an accommodation option for everyone, regardless of your budget. Uluru-Kata Tjuta National Park is where you will find Uluru and Kata Tjuta (The Olgas), so if you are visiting and wanting to stay overnight, this resort is where you will have to stay. 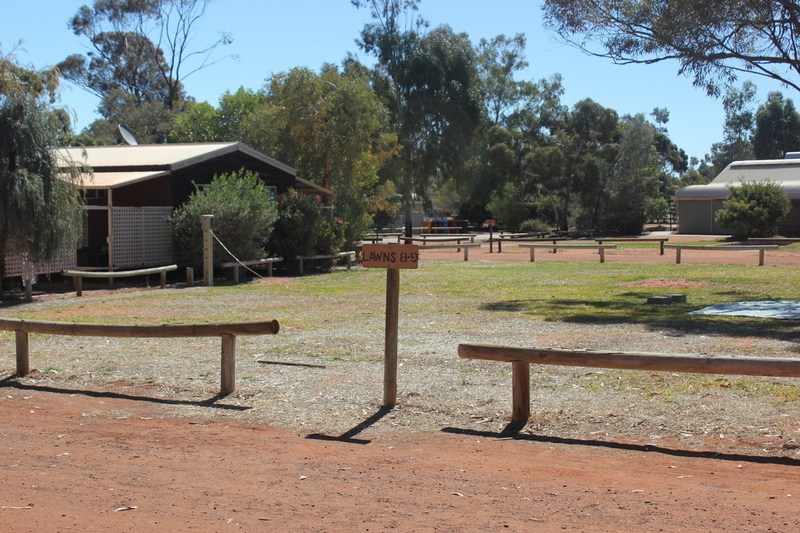 It is an excellent facility and its proximity to Uluru makes it a great stopover. There is no camping allowed anywhere in the National Park itself, nor any camping allowed in the areas surrounding the resort. 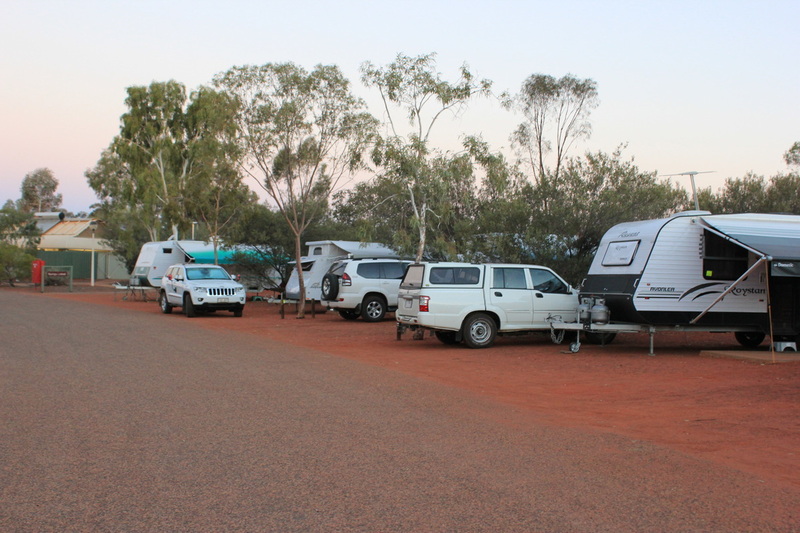 Yulara campground caters for all sorts of camping styles. Bookings for powered sites are highly recommended during the peak time of May-August. I know some people have complained about the cost to stay here, but the facilities and options available to you as a camper, are of a very high standard, and with that in mind, I found it to be very reasonable. And also considering the location - you are in the middle of Australia, off the beaten track! The tent sites (and non powered area) are numerous, but you can’t just pick whatever tent site you want. You will be directed to a grassed numbered area, and then you can camp wherever you like within that particular area. We arrived on a Monday, and were given a few areas to choose from – you can drive around each area to select your spot (the actual camping area is surrounded by bollards, so you can’t drive onto the grass). Management closes off grassed areas, after a bit of use to allow the grass to regenerate. Whilst this is totally understandable and necessary, it means that all the tent campers arriving were being put in a small area, right next to each other! There were more campers than open areas. So finding privacy between tents was problematic. Fellow campers told us of the night prior to our arrival (a weekend) on how crowded it was and a little disconcerting to have so many people in 1 grassed area! Shade is available – but limited in the unpowered area. Trees are generally around the outskirts of each grassed area. Pictures below show more of the camping area for tents/unpowered sites. If you are in a caravan, there is a separate area for you, as there are separate areas for camper trailers and motorhomes as well! It reminded us of all the different campers, being segregated by species! Facilities at the campground are excellent. There are large toilet/shower blocks, with very hot water. In the unpowered area, there are 2 large blocks. Whilst they are looking a little tired these days, the cleanliness of them was of a very high standard, which is the most important aspect. I did not see any family bathrooms in the area we stayed, which makes it tricky for families with small children. There are camp kitchens for campers. They are large and once again, very clean. The camp kitchen nearest to us, had 2 free BBQ's, 3 fridges (great for keeping your food cold if the ice is running low - just ensure you name and date all food/drink), only 1 washing up area (meant there was a queue), microwave and plenty of seating areas. There were no hotplates There were not any saucepans/utensils etc as apparently they get stolen! A toaster is available from reception area with a $50 deposit. There was a electric kettle. The camp kitchen proved very popular at meal times, plus was a great spot to charge your devices!! Lots of power points and they were in demand! Scattered around the camping areas are free BBQ's that do come with 2 burners as well! Great idea to have that option, especially as the camp kitchen didn't have any way to cook with a saucepan. Laundry facilities are provided and the laundry near us was of a high standard. 6-8 washing machines and 6-8 dryers, plus a few large sinks. The laundry had table and chairs and a TV, so if you wanted to wait for your laundry, you had that option too. Another fridge was also in there. Plenty of clothes lines outside as well, which is a welcome change. A swimming pool is also located near the reception area of the campground, but when we visited, was closed for landscaping maintenance. We could use the pool that was at the Outback Pioneer Hotel (can walk there, or a few minutes by car). The main reason you are probably here is for Uluru right? 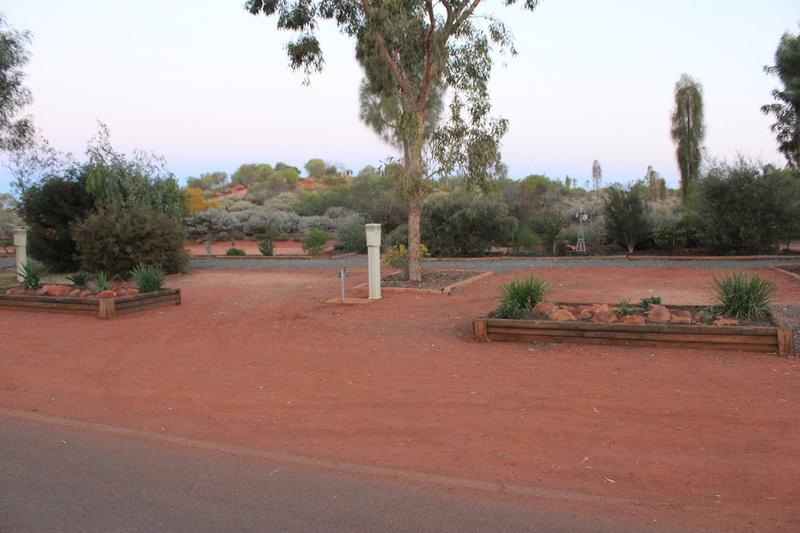 Then this campground has a number of lookouts that allows you to see Uluru and Kata Tjuta before you get up close! And even after visiting Uluru, you will probably want to utilise these lookouts on return to camp, as you never get tired of seeing this amazing rock! The picture above was taken from the Resort grounds. To get up close, its a car trip, about 18km further on from the resort. Entrance fees are required to this National Park for adults (time of writing $25 for a 3 day pass, per adult). 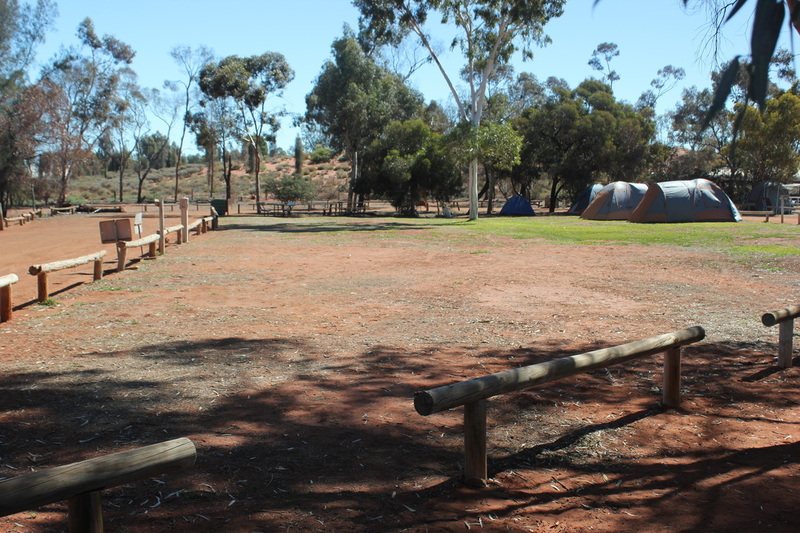 Another plus of this camping area, is that because its part of the Ayers Rock Resort, there are a lot of benefits to that. The Resort is beautifully laid out, and large so a free shuttle bus can take you where you need to go. It runs regularly throughout the day and night, and is a good way to see more of this resort. Plus there are daily activities run for all guests - no matter where you are staying. Most take place in the Town Square, and if you have time, check them out! Aboriginal dancing, boomerang throwing, art and craft market to name but a few. When you check in at the campground, you will be given a list of them all, so take the time to see if there something that appeals. A petrol station is within the Resort. It had the most expensive petrol of our NT trip : $2.17 per litre. But as you are such a long way from anywhere, you really don't have a choice, so you just have to pay it. We really loved our time at Yulara. Originally, we thought 2 nights would be enough, but we ended up staying for 3. To see Uluru and Kata Tjuta, are must-sees for every Australian, and if they are not on your bucket list yet, please add them! No photos will ever convey how incredible these sights are. 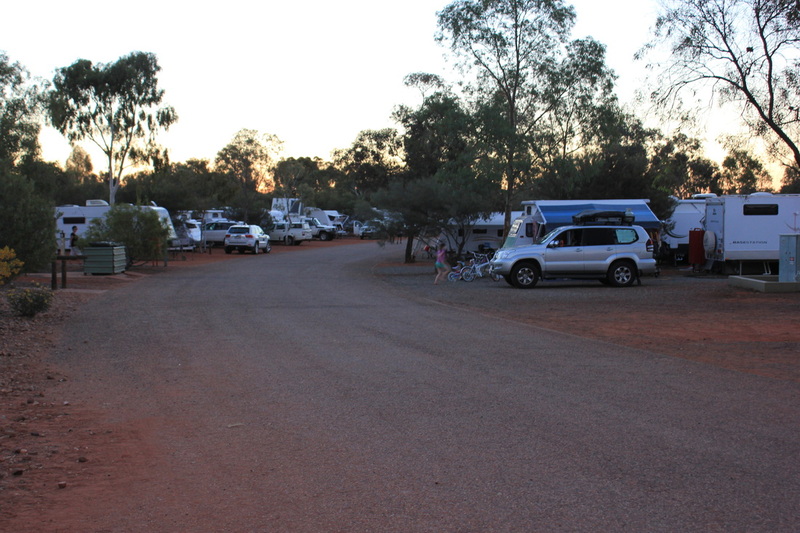 The campground is of a very high standard, and well maintained and clean. Only a couple of gripes - you can hear a generator running all night (or some sort of machinery). We couldn't pinpoint where it was coming from, but it would be nice to hear nothing but silence in the middle of the night! And secondly, putting too many campers in the grassed areas, so people are on top of each other. We got lucky and it wasn't too bad for us in our grassed spot, but we saw groups who were really far too close to each other - some left after 1 night as they weren't happy with being so close to others - especially when you can see wide open spaces vacant. Would we recommend this campground? Most definitely. It really was a great spot to base ourselves whilst exploring the Park. Plus the extras provided by staying in the Resort were an added bonus!